VANILLA BEAN KIT KAT - (FOUND THESE @ SAMURAI BURRITO) - EAT WITH HOP! 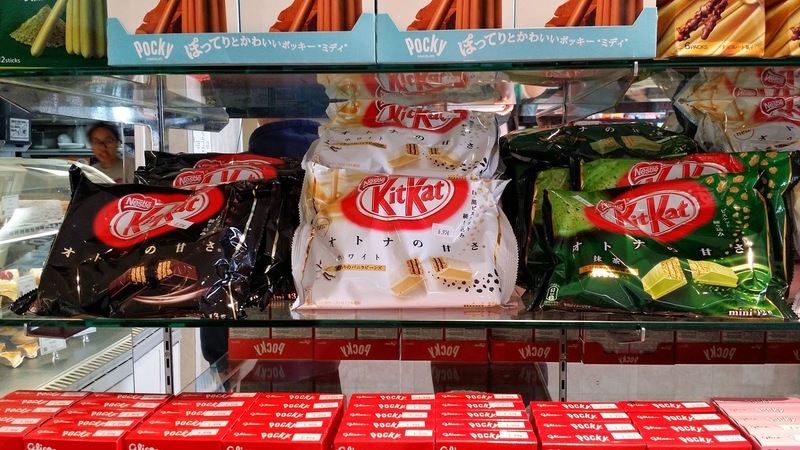 FROM LEFT TO RIGHT: DARK CHOCO KIT KAT, VANILLA BEAN KIT KAT, MATCHA KIT KAT. 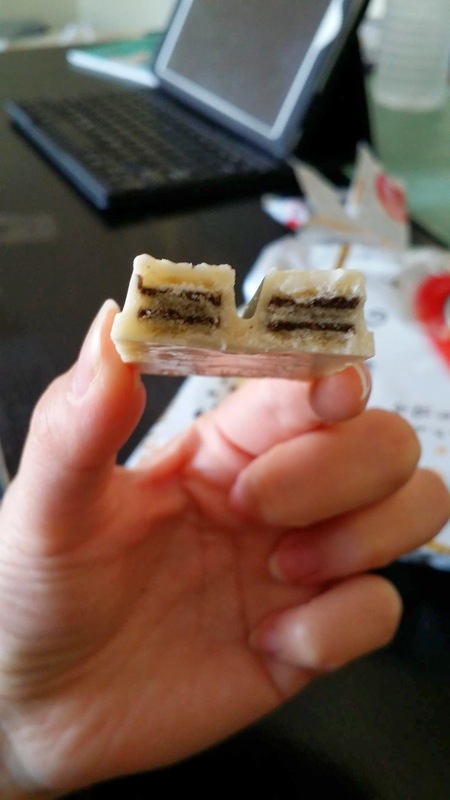 When I was living in Japan, the dark chocolate kit kat and matcha kit kat are actually the 2 MOST COMMON kit kats besides the regular ones that can be found in any typical supermarket or okashi (snack/candy) store. I started to OBSESS over the dark chocolate one and that became my favorite! Then, I decided to look to my right side and THERE LAID THE KIT KATS! 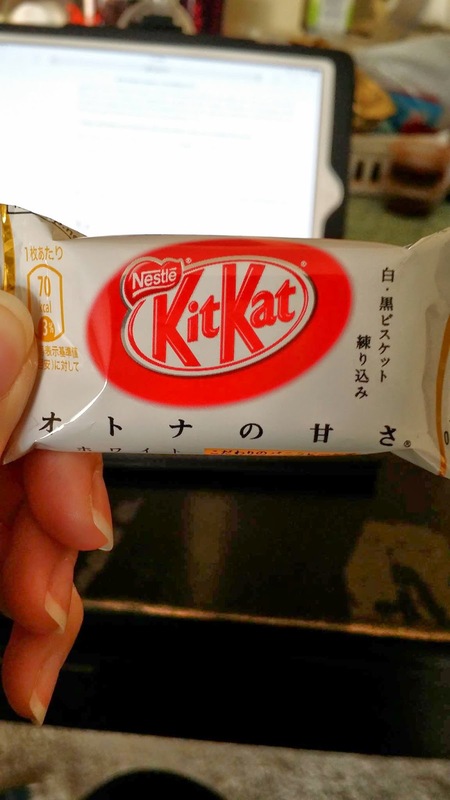 They have other Japanese goodies and snacks too but the ones that caught my attention were THE KIT KATS! I CAN'T BELIEVE THEY HAVE THE DARK CHOCOLATE KIT KAT HERE. MY FAVE! I decided to buy a more interesting flavor that I've never seen or heard of! The VANILLA BEAN KIT KAT. REMINDS ME OF COOKIES AND CREAM! But damn... they sell these babies for about $7. THAT'S HELLA EXPENSIVE. There are about 12 pairs of kit kats in these packages so that's really expensive. ESPECIALLY COMPARED TO JAPAN! I used to buy these in Japan for 250yen (about $2-$3 depending on the money exchange rate). OHYEA. About the Macarons here, they were aiiiiiiiight. I bought the green tea, the salted caramel and another one that I forgot. Maybe it was raspberry but I'm not sure. The best one was the salted caramel! It was extremely flavorful and strong. The others were mediocre.